The Minicom by Tripplite Smart 116 SPU is an 16 port, single-user analog KVM switch giving you the ability to control multiple computers or servers from a single USB or PS/2 keyboard/ video/mouse console. The rack mountable, 1U-sized switch features innovative ROC (RICC on cable) dongle technology that directly connects you to each server in the rack, eliminating cable clutter and the need for multiple consoles. Transmission Distance Up to 30m/99ft. Question: I have an older Minicom are the RICCs 1SU51019 compatible with the 0SU22182A? Answer: Thank you for your inquiry. 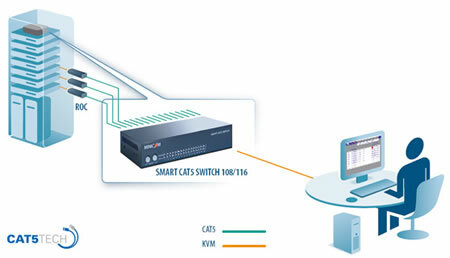 It does appear the 1SU51019 is compatible with at least some, (if not all) firmware versions of the Smart CAT5 KVM family, of which the 0SU22182A is a member.